A week before it collapsed, Glenn Arcaro started scrubbing his social media profiles of any mention of BitConnect. Arcaro also shut down his Future Money website, which was instrumental in promoting BitConnect and recruiting new investors. After doing so Arcaro went into hiding and has not been seen or heard from in public since. He is believed to be hiding out somewhere in Europe. BitConnect’s collapse meanwhile has resulted in a collapse of about $2.4 billion in market value, with real-world victim losses running into at least hundreds of millions of dollars. Rather than face his victims, Arcaro is instead threatening those calling him out with legal action. 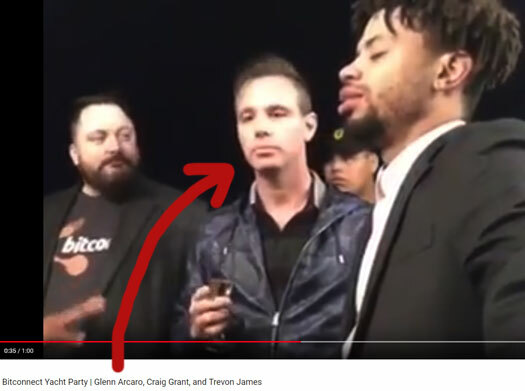 About a week ago BehindMLM ran a story covering a $1000 bounty offered for Glenn Arcaro’s and fellow BitConnect shill CryptoNick’s” whereabouts. The bounty was offered by Badisse David Mehmet (right), who publicized the offer through his YouTube channel. On January 24th Arcaro responded by threatening Mehmet with legal action. cease and desist from disparaging and defaming Mr. Arcaro regarding BitConnect. In your YouTube account, you posted multiple videos and comments disparaging and defaming Mr. Arcaro, accusing him of participating in the so-called BitConnect fraud or scam, portraying him as a “thief”. You repeatedly claim that he is an officer, director, and shareholder of BitConnect. However, Mr. Arcaro previously advised you that he never such a position [sic] or role in BitConnect. Naturally anyone remotely familiar with BitConnect will point to Arcacro’s listing as a Director in a UK shell company related to BitConnect. Don’t worry though, Arcaro’s lawyers have that covered. We are in the process of correcting his role with the United Kingdom’s Companies House as he never gave BitConnect permission to list him in such roles nor has he ever acted in such capacities. The shell company in question is BitConnect International PLC, which was incorporated last September. On January 16th Arcaro’s bogus UK address was struck from the document as a forgery (scams providing fake addresses in their UK incorporation documents is the norm), however Arcaro’s position as a Director still stands. As per a Confirmation Statement filed October 3rd, 2017, Arcaro retains 181,818 shares in BitConnect International PLC. Funny how Arcaro, who is listed as a Director along with several other top BitConnect investors from around the world, didn’t have a problem appearing as a BitConnect Director until the Ponzi scheme collapsed. Arcaro’s letter goes on to cite Mehmet as the author of three articles on three separate blogs, one of which is our own BehindMLM article covering Mehmet’s $1000 bounty. And despite Glenn Arcaro making millions through BitConnect, a Ponzi scheme that defrauded thousands of investors, his lawyers insist this isn’t a crime. (iii) ever held a position of ownership in BitConnect. Thus, your websites contains false and libelous information and statements about Mr. Arcaro. While I can’t personally attest to what Mehmet might have published elsewhere, in our two articles we here at BehindMLM never actually referred to Arcaro as a criminal. In any event, profiting from Ponzi schemes is a crime in the US and those who do so are subject to potential clawback litigation. So technically even if Mehmet asserted Arcaro is a criminal, based on his profiting in the BitConnect Ponzi scheme, he’s not wrong. The argument that no criminal charges have been brought doesn’t hold up because a Ponzi scheme is such regardless. Tellingly, Arcaro’s lawyers don’t dispute he made millions through BitConnect. Mehmet’s response to Arcaro’s cease and desist is that it’s “absolutely ridiculous”. Mehmet maintains Arcaro is a Director of BitConnect and reiterates the address forgery (not Arcaro being a Director) is only based on Arcaro’s claim it is so. Regarding his comments about Arcaro, Mehmet claims they are protected by absolute privilege. I am covered by a defense of truth, absolute privilage [sic] because my video posts were investigations in the preparations of filing a lawsuit against Glenn Arcaro and to warn others of his involvement with the illegal activities of Bitconnect. Yesterday a class-action lawsuit was filed by BitConnect victims against the company, Glenn Arcaro and several other top promoters. I was sued before by an attorney for defamation and I won, okay? And I got sanctions against him. And my counter-claims survived. You file a frivolous defamation claim against me (and) I’m gonna counter-sue. And I’m going to ask for sanctions against (the) attorney as well. Personally I can’t see Arcaro following through with threats of legal action. In addition to now having to deal with the class-action lawsuit, Arcaro is likely on the run from US authorities and doing everything to stay off the radar. I mean let’s face it, unwanted attention is what this cease and desist is really about anyway. Shame though. Always amusing to watch Ponzi shills file lawsuits and lose over and over again in court.